Welcome to the new Supplement Guide! Feel Good Supplements is the fourth book of the “Feel Good” series, following Feel Good Nutrigenomics, Feel Good Biochemistry and Feel Good Nucleotides. The first book, Feel Good Nutrigenomics, focuses on the basics of methylation, WHY methylation is so critical for health, and why you want to consider nutrigenomic testing. The second and third books, Feel Good Biochemistry and Feel Good Nucleotides are tools to help you and your doctor to determine WHICH supplements may be useful to help balance nonideal results on biochemical tests. Feel Good Nucleotides is more of a basic background on RNA and DNA based nucleotides with the history and references supporting their use. While, Feel Good Biochemistry primarily lists those supplements to consider based on biochemical imbalances, without explaining the details of their potential action. This book, Feel Good Supplements explains WHY I like to use each supplement, helping you and your doctor to determine WHICH, amongst a potential list of supplements to utilize, as well as WHEN to consider different forms of the same nutrient (ie different types of selenium or magnesium or GABA). Since I do not look at supplements in a traditional way in terms of their use, I feel this book, Feel Good Supplements, will be a help in determining which supplements you may want to add in a variety of circumstances (after deferring to your own doctor) when using the Yasko Protocol. Please understand, I am not making claims, I am not saying that any supplement or herb is the magic bullet nor will it cure a given health condition. What I AM doing in this book, is to share my personal beliefs, feelings, observations and conclusions after literally decades of using these supplements/herbs and personally following their impact on tens of thousands of biochemical tests. My background is as a researcher, having spent years in both academic, biotechnology and molecular labs. I am driven by hard data and results. My thoughts and observations about supplements/herbs are not based on perceived symptoms, rather on the results of biochemical tests run prior to the use of these supports, and then follow up tests after the use of these same supports. The program I have designed is data and test based. The ‘Roadmap to Health’ that I have outlined for you to follow this program is to run a test, followed by suggestions I have made for you and your doctor based on those results. I ask that you rerun those same tests after a period of time to ascertain if those supplements/herbs had the desired effect on actual test values. As you progress and test regularly, I make additional suggestions to help fine tune your health goals. If you are not progressing as desired, then new suggestions are made, again to be considered with your own doctor and the process is repeated, with regular testing until positive results and better health has been achieved. The program is set up in such a way that you are expected to be working with your OWN doctor. You can run the tests for my personal comments or you can run the tests through your own doctor. If you choose the later, then the Feel Good Biochemistry book literally walks you and your doctor through what supplements or herbs I suggest you consider based on each test result. I share all of my information and knowledge freely, the goal is to help as many as possible who choose to follow my protocol. In a similar fashion, in this book, Feel Good Supplements, I go through each supplement that I use, one by one, and explain what I like about that supplement/herb. My observations and conclusions are not always the more ‘classic’ use of a support. My unique view or vantage point on supplements/herbs is my personal opinion, and again as always please work with your own doctor on all final supplement choices. Finally, this book is designed to interface with my supplement list. Even if you do NOT want to use the supplements from the source that I use, this list is still a valuable tool for you and your doctor to work from. The supplement list is organized into sections based on Nutrigenomic SNPs as well as by category based on biochemical tests. Looking at the list of supplement suggestions in a given category helps you and your doctor to narrow down potential supplement choices based on either your SNPs, or an imbalance on a biochemical test result. The lists of supplements by category are suggestions you can consider depending on your particular needs. So even glancing at the check list can help you to see what you may be missing in a specific area, and may help to guide you and your doctor in terms of what to consider as the next supplement/herb you may want to add. This new book is tied together with an updated supplement format to make listing the supplements you are using easier for all of us. The new list (coming soon!) has an alphabetical section in the front, where you can check off what you are using and the dose. This will then automatically fill in the sections where supplements are listed by category. It is IMPORTANT to LOOK AT THE SUPPLEMENTS BY CATEGORY as well as the alphabetized list, as those categories show you which areas may be lacking in support, or if you have a particular health issue what other supplements you may want to consider. Even just glancing through the supplements by mutation or category enables you to quickly see areas that need more support and areas where you are weak in support. In addition I have added a number of new sections of special categories to help with some of the other health conditions that have drawn a diverse range of individuals to this program. For instance if you are a premenopausal/menopausal woman, or an adult male with some prostate concerns, or someone whose immune system is allowing for uncontrolled growth of unwanted cells, the new supplement list includes special categories that you can glance through to see which supplements you and your own doctor might want to consider for support. These are variations of the programs I had posted years ago that ranged from supplements to consider for men’s health to women’s health to those looking for additional supplement support for stress/anxiety or unwanted cell growth. Between the new supplement book and the supplement list by category it should enable the larger number of individuals with diverse health concerns to more easily implement this program with their own doctors. In terms of supplements I want to clarify that you do NOT have to add every single supplement in a given category or every single supplement I may suggest on a test for you. These lists of supplements are options. IF you have a significant issue in a particular area then you may want to add all of the listed supplements. On the other hand if an issue is less of a problem, you may only want to add one supplement in that category. I am giving you and your doctor my expertise and knowledge of what potential supplements may be a help for a given imbalance and then I leave the choice to you and your doctor to determine how many of those supplements you ultimately need and want to add. So again, looking through the categories, especially those categories that are more of an issue, is a TOOL to help you see what you may be missing. The second aspect to making supplement choices is to run biochemical tests to actually verify that the choices you are making are in fact having a positive impact. If not, then go back to the list and see what you may be missing in terms of support under that particular category. Again, to reiterate, the suggested supplement list is broken into categories. It is not necessary to take every supplement in every category. However, depending upon the severity of a particular symptom, you may find it necessary to use every supplement listed. It is always possible that a particular individual may be sensitive to an individual herb or supplement. It is best for this reason to add supplements slowly to the program, allowing several days to be certain that the newly added supplements agree with you before progressing to add additional new supplements. Yes, it will take a while to introduce all the new supplements. It is important to remember to be calm and patient, and not feel the need to rush through the program. The initial suggested starting dosage on any supplement listed is 1/2 to 1 whole unless otherwise noted. This will be well below the dosage suggested on the labels of the bottles. The approach is to try to rebalance a number of pathways in the body simultaneously. If you begin to think about the body as a roadway system, imagine that you are supplementing the main road, the side roads, and the back roads all at the same time. This requires a small amount of a large number of supplements. This is the way the body is accustomed to working, having multiple pathways and feedback systems to get to the same point. I often talk about following my program as designing your personal RoadMap to Health. Working from this analogy, the biochemical pathways in your body are more diverse, more complex and more comprehensive than the entire highway system that crisscrosses our nation. 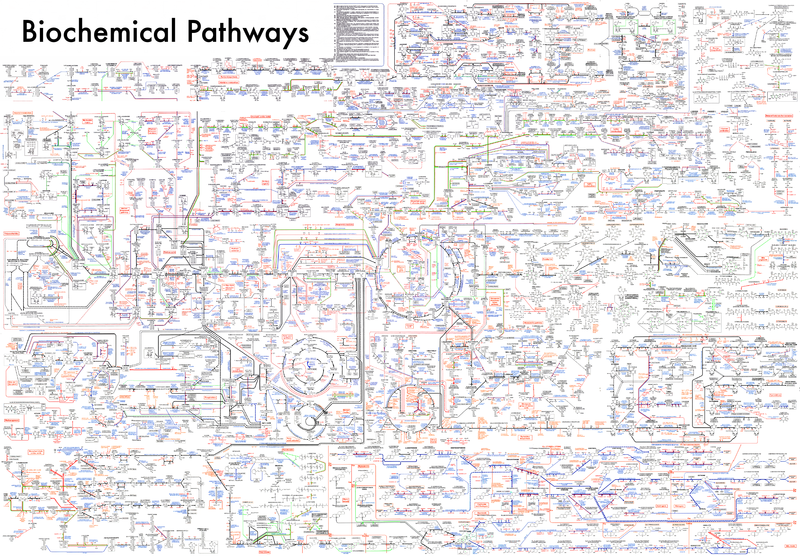 Please take a moment and look at the image of biochemical pathways I have included. It is literally staggering to see the number of pathways in the body. This diagram of the interconnected biochemical pathways in the body illustrates visually why I feel it is so important to add multiple supplements to help to support numerous pathways in the body. Simply adding high doses of single supplement is like using a bulldozer to clear an accident on the highway, a brute force approach which causes collateral damage. On the other hand, if you recognize that there is more than one way to get from point A to point B, that you can take the highway, a second major roadway, a side road and a number of back roads, this opens up more gentle approaches to addressing the “accident” on the freeway. If you look to clear or bypass the accident as well as ensuring that all of the alternate routes are supported properly then you are more likely to keep traffic flowing in spite of the blockade on your major highway. The philosophy here is to recognize the pathways involved, the way in which they are interconnected and then supplement with small amounts of a number of nutrients to support the overall health of the entire pathway. It is a truly beautiful and remarkable system of biochemical intermediates in our bodies that help to keep all of the necessary systems functioning optimally. The longer that one or more of these systems has been out of balance, or the more significant your health issues, the more of these pathways that may need support. I would always rather use lower doses of multiple supplements to help to work with the body, in a manner in which it is accustomed to functioning. The slow and gentle approach to blanket the system. DO NOT use any supplements you or your doctor have concerns with, and again DEFER TO YOUR OWN DOCTOR on final supplement choices. One place where individuals can have difficulties with a supplement plan is the source/quality of the supplements/herbs/ vitamins they are using. We have all heard people say “Oh, I’ve tried that before, it doesn’t work”, only to find that when they use a high quality version of that same supplement, it does in fact make a difference for them. Alternatively, there are cases where individuals were following protocols with great success, only to find that they were not doing as well when they switched to another brand of supplement, or one that was not stored properly. It is therefore important to consider “supplement quality” as an aspect of any nutritional plan. Supplements are not regulated in the same manner as prescription medications. As a result supplement quality can vary greatly. Use good judgment in choosing your source of supplements. Please do not be guided simply by the price. The difference of a few dollars may mean the difference between a successful supplement program and one that is mediocre. In addition, supplements can go off or spoil (similar to fresh produce) if they are not stored or shipped properly. Consequently, it is not simply a matter of supplement brand, it is also important to consider other factors, such as how that supplement or herb was stored (in a hot stockroom or under controlled conditions), how long it’s been sitting on the shelf and how it was shipped. I am very serious about supplements, as I am relying on them to help me to support long term health imbalances. I need to count on the quality of the components doing what I expect, and to demonstrate positive tangible results on follow up biochemical testing. When I began to practice alternative health care I did not set out with the intention of designing supplements or finding a source of the highest quality supplements. However, not all supplements are made under the same high standards that are necessary to have successful results. As a result I became involved in designing my own supplements and setting high standards for these supplements in order for them to be acceptable for sale in my personal opinion. In contracting to have these supplements produced or private labeled I insist on only the highest quality. The source I use for supplements, Holistic Health International actually gets fresh supplements delivered continually, as I look at supplements the same way that I look at fresh produce. You would not want to use lettuce that had been sitting in your refrigerator for months at a time, so why would you want your herbs to be sitting around for long periods of time. In addition the analogy to fresh produce extends to how they are stored. Storage conditions will play a role in terms of supplement or herb quality, so that even the same brand supplement may not have the same efficacy if it is not stored properly. If you think about herbs the way in which you think about fresh produce, you can easily understand why you really want fresh herbs that have been stored properly, not the ones that can be purchased at a discount because they are day old bruised, brown and wilted. I try very hard to share knowledge and suggest supplements without making it sound like individuals should only use the source that I use for these products. And I truly do want individuals to feel they can purchase their supplements anywhere they choose and still be able to implement this program. On the other hand, supplements or herbs that are purchased from chain stores are often bought by these stores in bulk, and sit in a hot store room for months before going on the shelves and therefore will lose efficacy. By the time you purchase an herb or supplement from a chain store or even most health food stores it has been sitting in a warehouse or on the shelf for months. Conversely, I insist on fresh supplements and herbs from the suppliers on a regular basis. This is in part why supplements carried by HHI will may occasionally show as ‘out of stock’ while waiting for the latest shipment of fresh supplements or herbs to arrive. Where I am relying on these supplements and herbs to make a positive difference, and I am actually measuring through biochemical testing so I can SEE the difference in supplement quality, I need to know that I can count on them and not worry about where they came from, how they were stored, and ultimately their efficacy. I take the responsibility of cross checking the ingredients of supplements from HHI to be sure they do not have hidden sources of glutamate, aspartate, aspartame, etc. I am personally updated about changes in even minor supplement ingredients, and depending on those changes I may choose to discontinue a given supplement or herb; I literally receive multiple emails weekly with ingredient changes to supplement labels. Thus, if you are purchasing supplements from other sources I cannot stress highly enough that you need to CHECK ALL of the ingredients for hidden sources of excitotoxins or other non-ideal ingredients. Remember that magnesium aspartate IS in fact a source of aspartate or that an ‘amino acid chelate’ will include glutamate and aspartate in that chelate. When individuals send in their supplement lists with tests for my comments, I always ask for ingredients of ALL supplements being used that are not ones that I suggest. It is rare for me to go over a supplement ingredient list and NOT find something offensive in a supplement from a source other than HHI. Needless to say I drive people crazy at HHI in terms of the sourcing and purchasing of supplements for this program. To say I am picky, does not even touch on it. But again, I am relying on these supplements to have results that I can ACTUALLY measure on tests, so it is crucial to me that they have only ingredients I am comfortable with. It took over two years to individually source each and every component of the customized compounds that I use for the program. Basically, every single source for each ingredient was ordered, sampled tested, sent out for QC before we even started to combine the ingredients. By picking the highest quality individual ingredients I believe we end up with a more effective product in the long run and limit the potential of nonideal ingredients or contaminants in the final supplement product. I am a very strong supporter of the use of herbs. However, herbs can be contaminated with heavy metals. This has been a particular problem with herbs from overseas. In addition it is important to realize that even “organic” still means you need to be aware of possible contaminants. As an example rice and rice milk contain non-ideal levels of arsenic, even rice that comes from a health food store or is labeled organic may be contaminated with high levels of arsenic. (https://www.fda.gov/downloads/Food/FoodborneIllnessContaminants/Metals/UCM352467.pdf). For this reason every lot of rice flour used in several of the HHI products is tested to ascertain that the level of arsenic is well below the published regulatory limits in Proposition 65. While the regulatory limit is 10ppm per daily dose of arsenic, HHI has even tighter standards of no more than 2 ppm. And to date, HHI has actually only used material with less than 0.24ppm. In a similar fashion, HHI has their custom products tested to rule out heavy metals prior to sale of custom products as well as additional testing at regular intervals after that product has been produced. In addition, every single ingredient in each of the custom products is tested individually every time that product is produced. This is far and beyond what many companies even consider doing. Heavy and toxic metals are a particular problem when companies in this country include herbs from overseas. I use these as examples to emphasize the thought and care that goes into the testing of the products I deem as acceptable from HHI. I am NOT saying that everyone has to purchase all of their supplements from HHI, but I do want you to realize that HHI not only sources the highest quality ingredients but also has extensive testing run on those products to check their quality. You do NOT have to purchase your supplements and herbs from HHI, but you do want to be sure that wherever you are obtaining your nutrients that they have been tested for heavy metal contamination. We want to be sure that the metals we are seeing excreted on HMT, UTM and FMT are not from a continuing exposure to toxins in supplements that are being ingested. “Good morning! I wanted to share something in case it might be helpful for others diagnosed with celiac and starting the program. My daughter with celiac has been on the protocol for about 17 months now. We are well into Step 2, so she is taking quite a few supplements every day (almost all are purchased from Holistic Health). When we started the program, I was nervous about adding in so many supplements and hoping that there would not be any trace gluten. We do check celiac antibodies annually and just got back results again yesterday. The situation with respect to lactoferrin is another example of the attention given to each aspect of every supplement for my program. Lactoferrin is a key supplement that can help with gut inflammation. It is measured directly on stool tests and so it can be literally seen to be out of balance on gut tests when there are issues with gut microbes or gut inflammation. Lactoferrin has been reported to aid in prevention of viral and bacterial infections and may help balance iron levels as well as in balancing energy pathways in the body. It is therefore an important nutrient that many with gut issues may be deficient in. Thus lactoferrin represents a bit of a catch 22, in that those with gut issues may benefit from its use, yet lactoferrin is derived from a milk source and many of those with gut issues are also casein sensitive. It was therefore important to me to have a source of lactoferrin that would be acceptable to the casein free population using this program. In order to go that ‘extra yard’ in terms of casein levels, I had samples of Mitoforce sent out for an analysis of the amount of casein that was present in the highly purified source of lactoferrin that custom product contains. The results from the testing by an outside lab are that Mitoforce contains 1 ppm (part per million) casein which is equal to 0.0001% casein. For comparison, ghee is generally considered safe for those who are casein sensitive. Ghee has 0.11% casein or 1200 ppm compared to Mitoforce with only 1 ppm. In other words ghee has 1000 times more casein than Mitoforce. While there is no set limit to label something as ‘casein free’, a related point of comparison may be to the labeling of a product as gluten free. When foods are labeled as gluten free they need to be below 20 ppm; working from this comparison, the special lactoferrin used in Mitoforce at 1 ppm is significantly lower than would be needed to consider a product as free of another gut irritant such as gluten. This again highlights why I like to use supplements that have been specially sourced or designed for HHI. Having said all of the above, IF you are highly sensitive to casein and gluten you want to, AS ALWAYS, defer to your own doctor on ALL final supplement choices. And to reiterate, I am NOT saying you need to use supplements from HHI. I am saying you need to be aware of the quality, testing, storage and possible contaminants in the supplements you and your doctor do choose to use. I have devoted years to generate my protocol and the resources to implement it, making it available to as many people as possible. It is not just about having the information, it’s about having the tools. I have done the sourcing, work, the testing of these products and I have also seen and recorded the results. I take the extra steps so you don’t have to. What follows is an alphabetic listing of the supplements I have chosen to include in my protocol from HHI. I have painstakingly made comments on every supplement that you may want to use for my program. These are my personal opinions and observations based on years of using these supports and then running biochemical tests to ascertain that the supplements/herbs/vitamins had the desired impact from my vantage point. These are not claims, these are not guarantees, these are my thoughts that I am sharing with all of you. It is not the most exciting read, but I think you will find it to be an informational read. I truly hope that these descriptions will be a help for you and your OWN doctor in making final supplement choices. When looking at the supplement list by category, I would expect that having these alphabetic descriptions may help you to decide which supplements in each category may best suit your particular health needs. Disclaimer: The information expressed in this book does not constitute an attempt to practice medicine nor does it establish a doctor-patient relationship. This book is for informational and educational purposes only. Statements made in this book have not been evaluated by the U.S. Food & Drug Administration (FDA). The information provided is not intended to diagnose, treat, cure any disease or be used as the basis for treating a particular symptom or disease. Any products discussed or endorsed are not intended to diagnose, treat, cure any diseases or be used as the basis for treating a particular symptom or disease. The information expressed in the following pages is not meant to replace you working with a physician or health care practitioner when implementing any protocol discussed throughout the book. Laboratory test results and comprehensive discussions or analysis of the laboratory results are intended to provide additional sources of information for you, and your physician or health care practitioner. Always seek the advice of your physician or other qualified health care practitioner with any questions you may have regarding your medical condition or as it specifically relates to implementing any protocols or suggestions discussed throughout the book.